12 Brown Bread. To three Gallons of Flour, put three pints of skimmed milk and three pints of water, made milk warm, one pint of yeast, & three ounces of Salt. Let it lie in Spunge two hours. knead it very well half an hour. After kneading let it stand half an hour before the fire, and then put it in the oven. It is best baked in Tins. WhiteBread. 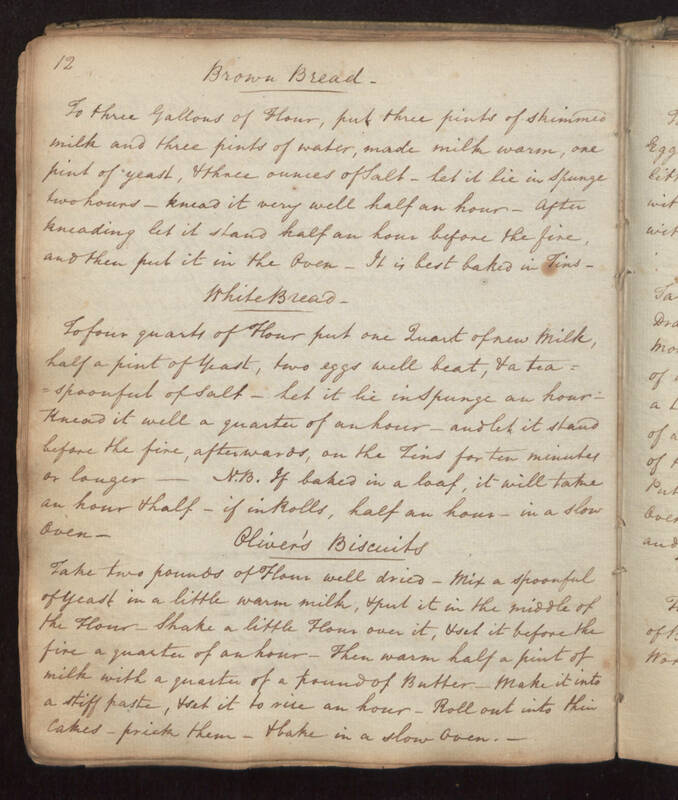 To four quarts of Flour put one Quart of new milk, half a pint of yeast, two eggs well beat, & a teaspoonful of Salt. Let it lie in Spunge an hour. Knead it well a quarter of an hour. and let it stand before the fire, afterwards, on the Tins for ten minutes or longer. N.B. If baked in a loaf, it will take an hour & half, if in Rolls, half an hour, in a slow oven. Oliver's Biscuits Take two pounds of Flour well dried. Mix a spoonful of yeast in a little warm milk, & put it in the middle of the Flour. Shake a little Flour over it, & set it before the fire a quarter of an hour. Then warm half a pint of milk with a quarter of a pound of Butter. Make it into a stiff paste, & set it to rise an hour. Roll out into thin cakes, prick them, & bake in a slow oven.